I think its fair to say we all know the benefits of a good skincare regime, but having a good skincare routine doesn't always mean forking out a ton of cash on high-end products. 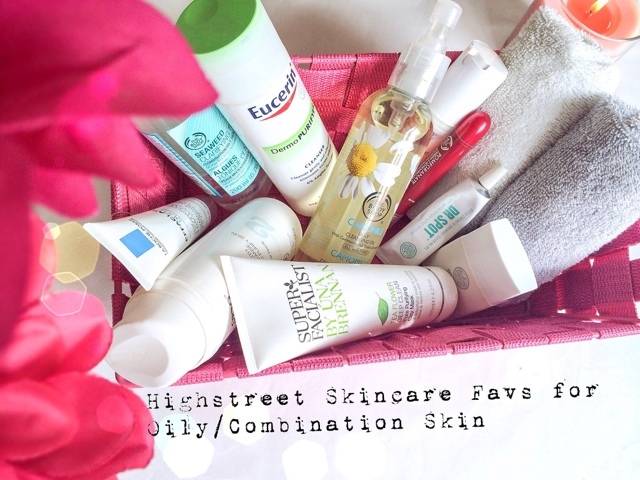 There are loads of high street brands that cater for all skin types and some are just as good if not better than their high end counterparts. 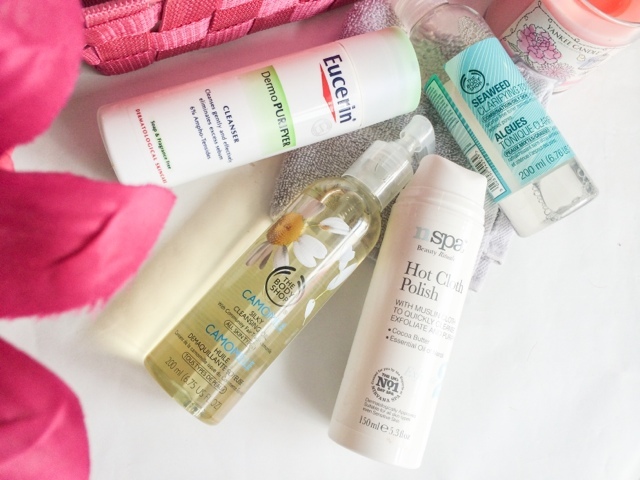 The products listed today are some of my favourites and are aimed at oily/combination skin types. They all do a fantastic job at keeping the skin clean, hydrated and tackling them pesky spots that pop up every now and then. I like to triple cleanse at night time and use this primarily to take off all my make up. This oil makes light work of removing make up and facial SPF's and is done so by applying it to a dry made up face. I massage the oil in for a good few minutes and the make up starts lifting off so your face resembles some sort of Picasso painting! All this is then wiped away with a flannel or muslin cloth. This is a great dupe for the Liz Earl hot cloth cleanser and works in exactly the same way. The thick and creamy consistency feels hydrating and nourishing on the face and works brilliantly at removing any last traces of make up. This also acts as a gentle exfoliator and buffs away dead skin cells when used with the muslin cloth (supplied). It leaves the skin feeling clean, soft and supple. This cleanser is fantastic at cleaning and purifying the skin without drying it out. It contains Salicylic Acid which helps clear up blemishes and neutralise bacteria while gently cleansing the skin and absorbing excess sebum (oil). It does so with out drying the skin out and because its soap, alcohol and fragrance free is suitable for all skin types even sensitive. You can read my full review here. What's a good skincare routine without a toner? This one is great at rebalancing combination skin and controlling oil levels. It removes traces of make up and cleanser and also help unblock pores, while being gentle enough not to over dehydrate the skin. When tackling oily skin its important to not dry it out as this can result in more oil being produced to combat it, thus making the skin a greasy hot mess and increasing the chances of breakouts and blocked pores. This leaves the skin feeling clean and refreshed, but not tight in any way. Serum, Moisturise, Treatment and Protect. This roll-on targets fine lines and wrinkles around the eyes while de-puffing the under eye area. The steal roll-a-ball applicator feels cooling and instantly refreshes the eyes making it perfect for morning use to help wake you up. I also find that the roll-a-ball makes it very easy and quick to use, and the product stinks in almost instantly. This serum has a light gel consistency that absorbs quickly into the skin leaving it feeling hydrated and moisturised but not greasy. It contains collagen boosting peptides to help reduce fine lines and wrinkles while minimising pores and revealing a more even skin tone. If you've had problems with your skin in the past the chances are you have heard of this or even tried it before. The Effaclar Duo+ is the Oompf'ed up version of the original, which I loved and actually prefer. Both offer some really good results when fighting oily and spot prone skin. The serum ( which I use as a moisturiser) lightly hydrates the skin while un-blocking pores and evening out the texture resulting in a more refined smoother complexion. When you have oily/combination skin the thought of summer brings back daunting memories of thick greasy sunscreens that attracted sand, hair and even flies - basically anything in its path! Well, thank god those days have past and now sunscreen are light and non greasy, just like this one from Soap and Glory. This sinks in within minutes and leaves no trace of its existence on your skin, it also contains mattifying ingredients to help keep the shine at bay during the day which is great for us oily girls! You can read my full review here. Breakouts and oily skin go hand in hand, so its essential to keep something in your stash for when problems arise. Dr Spot in very much like the Origins Super Spot remover ( which is a personal fav), contains Salicylic acid which helps dry up the spot in no time. The clear gel also reduces redness and helps cool down the irritated area while protecting it with a clear film. Unlike the Origins Super Spot Remover this don't look flaky or crusty on the skin so can be worn during the day under make up. Applying a mask once or twice a week will really help clear out blocked pores and give the skin a better more even texture. This one form Una Brennan does exactly that and does it gently without drying it out. It leaves the skin feeling deeply cleansed, soft and also helps shrinks pores and minimise their appearance. 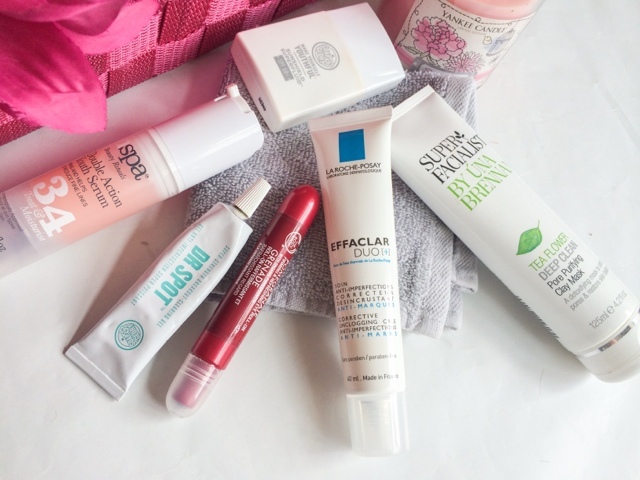 What are your high-street skincare favourites? I love the seaweed collection from The Body Shop it's fab! Great post. I Have just followed. Thanks your post. what should i do before or after apply The Body Shop Eye Roll On on my eyes? Apply moisturizing cream after use this?